How do you create architecture for a people who have no land? Eyewitnesses said that the smoke smelled like apples and garlic, and that people were laughing as they died. On the evening of March 16, 1988, in the closing days of the Iran-Iraq war, Saddam Hussein sent fighter planes — MiG 23s and Mirages — over Halabja, a city of 80,000 people in Iraqi Kurdistan. The planes dropped chemical warheads that burst into plumes of “white, black and then yellow” smoke, according to reports. Halabja lay near the border with Iran and, as a stronghold of Kurdish rebels, it had been shelled and bombed by the Iraqi army before. This time, though, it was genocide. People vomited green bile as they fell. Women died at their cutting boards, still clutching knives and carrots. Pictures taken by Iranian photojournalist Kaveh Golestan show the bodies of dead Kurds stacked like cord wood, forming hills of flesh large enough, in places, to distort the natural horizon. In death, “they became a layer of the new topography” of Kurdistan, says Alan Abdulkader, a Kurdish artist and architect showing at Spokane’s Kolva Sullivan gallery this month. After the attack, Halabja was razed to the ground along with hundreds of other ethnic Kurdish villages. The bodies were bulldozed into mass graves. The only way to properly confront this legacy, Abdulkader believes, is to raise them up once again above the ground, or to go beneath the earth ourselves. Abdulkader spent his final year of a master’s program in architecture working on ways to do both. But how does one build buildings for a people who, legally, have no land? The idea of Kurdistan, “the land of the Kurds,” has existed for a thousand years, as a place flanked by mountains at the sources of the Tigris and Euphrates rivers. With the exception of a brief two-year span (1922-24), however, there has never been a nation called Kurdistan. The Kurds have almost always been part of someone else’s nation or kingdom or caliphate. And within these political structures, they have almost always been oppressed. Today the borders of Iraq, Iran, Turkey and Syria cut Kurdistan into four parts. Abdulkader, now 28, was born in Iraq, but his family fled to Iran and Turkey before spending seven years in a Syrian refugee camp. He and his family eventually settled in the Seattle area. If Kurds have no clear-cut homeland, how could they have a clear-cut architecture? Abdulkader’s solution is to build structures around the idea of disappearance and invisibility. One project would attempt to undo the greatest disappearance ever perpetrated against the Kurds, figuratively raising the bodies of Halabja above their mass graves. His “Disappear” begins with a satellite image of a population center. On top of that, he overlays what look initially like snowy hills or perhaps mounds of garbage. Looking closer reveals arms, legs and faces. These are bodies hovering above the ground where they might have fallen, dead from inhaling a cocktail of serin, VX and mustard gas. 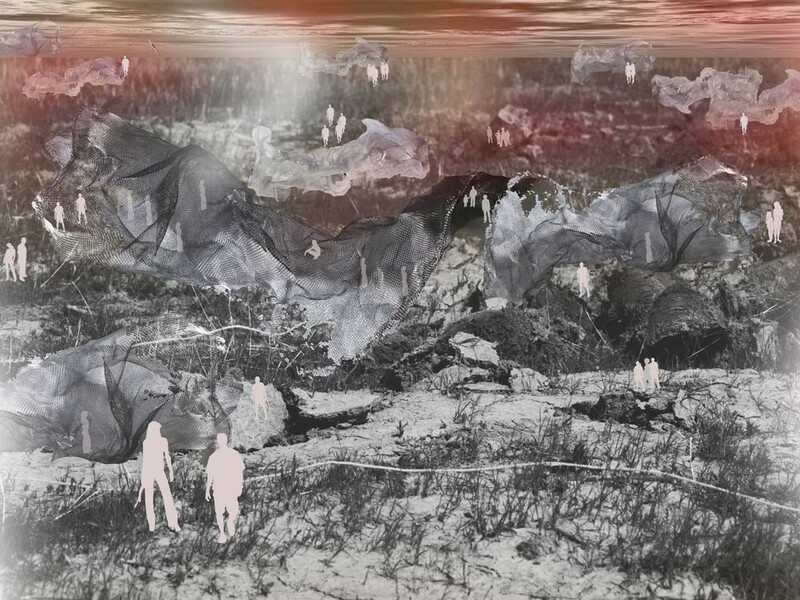 In “Body in Space,” that topography has become a translucent, mesh-like structure. You can see the new horizon it creates while also seeing the original horizon. It’s meant to be entered and climbed. Kurds in Iraq are now provisionally autonomous, but the history of their persecution remains entombed. It is only in building, he says, that we remember.